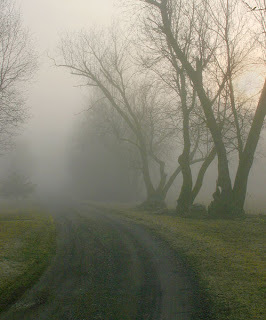 Have you ever gotten up early in the morning only to discover a heavy fog canvasing the sky? A fog so thick you can barely see your hand in front of your face? That had there been a bluff ahead of you, you could have easily walked off of it into oblivion? And driving in it? Nightmare, right? It's completely scary, depending on others to have enough sense to have their headlights on, driving slowly and cautiously until the fog is lifted. Have you ever been there? I have. Truth be told. Life is oftentimes a lot like a heavy fog. Life happens and all of a sudden we can barely discern what's in front of our own faces. It clouds our perspective, causes us to question the very things our lives are based upon. I've been there. I've not only been there, I am there. I'm in that place where grief has caused me to question everything. I've questioned God's goodness - how dare I, I know, right? Let's be honest, you've mostly likely been there too and if you haven't, consider yourself lucky. I've asked "why?" almost daily only to be met with total silence. I live in fear of something happening to Anna and Eli - seriously, just quiz them on stranger safety, you'll see what I mean. I'm in that place where trivial, everyday things send me over the edge - a drive by the hospital where Anna and Eli always announce "That's where we were born! ", wrapping a present for my nephew who should be here any day, the realization that I'd be at the 20 week mark today, finding out what we should've been having and choosing a name. But I refuse to stay there. I refuse to remain in a place of questioning instead of listening and learning. I refuse to believe that God isn't good, because He is. He's been so good to me. I was reminded Sunday that the battle isn't mine to begin with. Reminded that to see through the fog we must obey. "Do not be afraid; do not be discouraged. Go out to face them tomorrow, and the Lord will be with you. And reminded to worship him through the fire. Then sit back and watch Him pull you through. "As they began to sing and praise, the Lord set ambushes against the men of Ammon and Moab and Mount Seir who were invading Judah, and they were defeated." It seems so simple, right? Then why is it so hard? The mere word "miscarriage" did me in Sunday, complete with holding my breath knowing that if I breathed I would lose it. Teary eyed with a mix of anger and sadness, I sat there staring at the keyboard on stage telling myself to focus on the L in KURZWEIL. "Keep it together, Phoebe. Keep it together." Why do I feel like I have to keep it together? Why do I feel like I can't tell God I'm mad and hurt and don't understand? Isn't this part of realizing that the battle isn't mine? Isn't part of that relinquishing everything to Him and trusting in His goodness? Yes, indeed it is. And that's where I find myself. Giving it all to Him. The anger, the 'why's', the hurt, the pain, the disappointment. Giving it all to Him - because it's all His in the first place. The battle is His. And it's in this knowledge that I can say I'm finally coming out of the fog.